Exclusive Tru Tree™ camouflage pattern on a full size tally book. Your imprint on both front and back. Exclusive design! This tally books shows the popular Tru Tree™ camo pattern. The crisp clear image is made possible by our own "color rich" process. Pen not included. Matches the Tru Tree Coaster 4911. 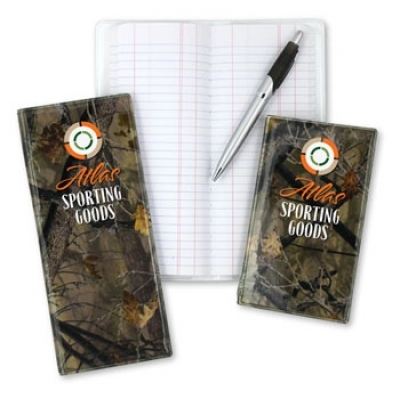 The hard bound cover makes it extremely durable in the field. Made in the USA. Tally books are essential tools in the oil and gas industries. Customers who need OD diameter tapes also need pipe tally books. This hard bound book is durable for daily use in the harshest environments. It can also be used in any other application that requires continual record-keeping. Imprint size: Both sides are available for your imprint.